Increasing consumer awareness towards safe drinking water, depleting fresh water quality and rising disposable income are driving the sales for water purifiers on high growth trajectory. In 2012, membrane based water purifiers were dominating the market with more than 40% revenue share. According to a recently published report by TechSci Research “Global Water Purifier Market Forecast & Opportunities, 2018”, the POU (point-of-use) water purifiers market has emerged as one of the most attractive segments in consumer electronics. 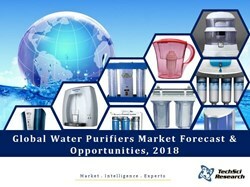 The global water purifiers’ market revenues are anticipated to grow at the compounded annual growth rate of around 10% during 2013-18. The report highlights that the global water purifier industry is highly fragmented with the presence of regional players dominating in their respective regions. Asia Pacific is the biggest market for water purifiers where China & India are the major contributors. The market growth of water purifiers in these regions are supported by rising domestic production, low penetration level of water purifiers, and growing awareness about water related health concerns. “In 2012, membrane based water purifiers were dominating the market with more than 40% revenue share. However, with the introduction of new technologies such as LINX the market dynamics are expect to witness radical changes in the next 4-5 years,” said Mr. Karan Chechi, Research Director with TechSci Research a global research based management consulting firm. “Global Water Purifier Market Forecast & Opportunities, 2018” has evaluated the future growth potential of water purifiers market globally and provides statistics and information on market structure, industry behavior and trends. The report includes water purifier market projections and demand forecasting. The report also details about the top 10 countries in-depth market analysis including market size, share and forecast. The report is intended to provide cutting-edge market intelligence and help decision makers to take sound investment evaluations. Besides, the report also identifies and analyses the emerging trends along with essential drivers, challenges and opportunities available in water purifiers market globally.